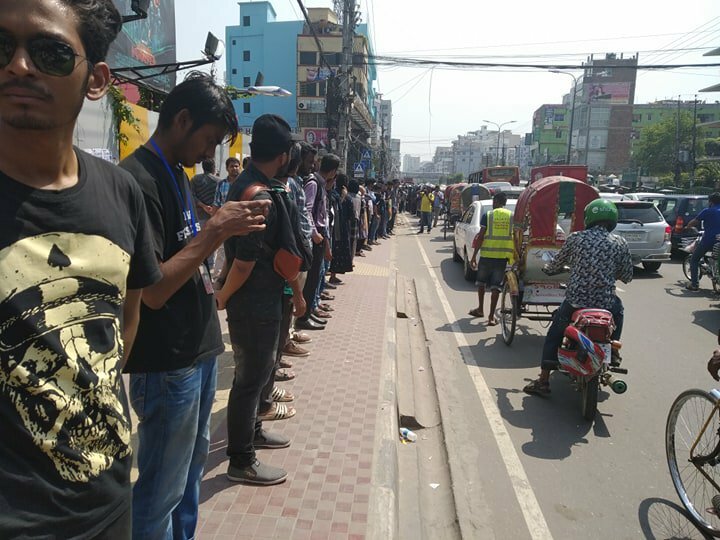 Protesting students have formed a human chain on Dhaka's Pragati Sharani Road, in front of Jamuna Future Park. Over a hundred students participated in the human chain, formed right beside the spot where Bangladesh University of Professionals (BUP) Abrar Ahmed Chowdhury was killed on Tuesday, from 12:30pm. They were demonstrating under watch of additional police forces deployed. Sub-Inspector Md Atik of the Vatara Police Station has confirmed the news. "They are staging a human chain program in front of the gate but they do not block the road today. They vhecular movement is normal in the area," he added. Some of the students at Progati Sarani also gave flowers to on-duty police officials during their program on the day. Abrar Ahmed Chowdhury, son of Brig General (retd) Arif Ahmed Chowdhury and also a student of Bangladesh University of Professionals (BUP), was killed in a road crash at Nodda area in the capital on Tuesday (March 19). Later on Wednesday, some protesters postponed their demonstrations by a week, until March 28.